The HardTalk Handbook is an interactive guide to mastering the science and art of difficult conversations we keep avoiding. Using extensive research and neuroscience techniques, it explores the reasons behind the way we behave when communicating and how to combat those behaviours that hold us back. It demonstrates how to resolve conflict and affect change, even in the most diverse organisations, no matter your culture, background or experience. Discover why we’d rather ‘put up’ instead of ‘turn up’ and how our natural instinct to ‘speak louder’ is far less important than ‘listening hard’. 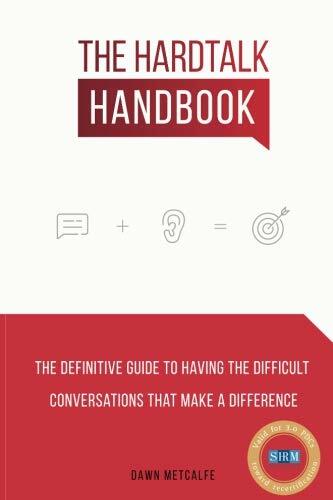 Whether you need to tell a colleague they smell, that your boss’s approach is ineffective or any other type of HardTalk you have experienced, this Handbook will show you the skills you need to succeed at the conversations that make all the difference.